The Keeshond's earliest roots are unclear, though the breed is known to be related to the spitz dog group that migrated south from the Arctic with ancient nomads. By the 18th century, the Keeshond was working as a watchdog on barge boats on the Rhine River in Holland. The Keeshond is a striking breed with a thick coat of black, gray, and cream fur, a pronounced mane and chest ruff, and a fox-like face. Keeshonden make wonderful companion dogs—loving, loyal, playful, intelligent, and respectful towards strangers. They are so devoted to their families that they won't tolerate spending time away from them and will demand constant company. Without attention and activity, Keeshonden are prone to separation anxiety and problem behaviors such as excessive barking and chewing. When they get enough exercise and company, they are laid-back and fun-loving dogs. The Keeshond is also known as the Dutch Barge Dog, Smiling Dutchman, German Spitz, and Wolfspitz. They are often called Kees for short. The plural for Keeshond is Keeshonden, but most people say Keeshonds to pluralize. Coat - Keeshonden have a luxurious double coat of long, straight fur that stands off the body, giving them a distinctly puffy appearance. The outer coat is harsh to the touch, while their thick undercoat is soft. The hair around their neck and on their chest is thicker and longer, giving them a regal mane. The fur is short and close on their face and ears. Long fur on the upper half of their rear legs makes it look as though they have on half trousers. The Keeshond's tail sweeps up and over in a pretty plume. The coat color is a mix of black, gray, and cream which can range from light to dark in overall hue. The hair on their muzzle is dark and they have 'spectacle' facial markings—dark rings of fur around their eyes that make them look as though they are wearing glasses. The Keeshond has an elegant, well-balanced carriage, and a showstopping coat. Their facial features are fox-like with small, erect ears, a wedge-shaped head, and alert eyes. They have a robust, medium build that is athletic beneath all that fur. Their gate is distinctive to the breed—bold, brisk, and sharp. Kees are affectionate and playful with family members, and amiable with people and dogs they don't know. Related to spitz-type dogs, such as Samoyeds, Chows, and the Pomeranians, early Keeshonden worked as watchdogs on boats traveling the Rhine River. The Keeshond name was taken from Cornelis 'Kees' de Gyselaer, a Dutch politician who led a rebellion against the House of Orange in the late 1700s and owned one of the dogs. Then commonly known as the Dutch barge dog, images of Keeshonden became a symbol of the Dutch patriot side of the conflict, while pugs were the symbol of loyalists to the House of Orange. When the rebellion failed, Keeshonden became unpopular and many were abandoned or destroyed because they were associated with the lost cause. But a small population of the breed survived as farm and boat dogs in Amsterdam. In the early 1900s, Baroness van Hardenbroeck restored the friendly breed's popularity and it drew attention abroad, first in England and later in the US. Dog fancier Carl Hinderer brought the first Keeshond to America and advocated for the breed. Known then as the German Wolfspitz, the dog demanded convincing for the American Kennel Club to recognize amid tensions with Germany between World Wars I and II. The breed was recognized in 1930 after a name change to Keeshond was agreed upon. Keeshonden are lovable, attentive, and gregarious. They are quick learners, and enjoy participating in dog sports and agility training. They are outgoing with strangers and look forward to visits to the dog park. Kees want to be with their people at all times, and are among the 'velcro' breeds who will follow you from room to room of your house. Are Keeshonden Good with Kids? Keeshonden love people, from grown ups to kids. If you're willing to spend time playing with them or take them for a walk, they'll consider you a fast friend. When playing with young kids, be extra attentive so the children don't pull the Kee's long fur and play doesn't get overly rambunctious. Are Keeshonden Good with Other Pets? Keeshonden are amiable companions to dogs, cats, and small animals, unless you skip the socialization process as a puppy. Without a proper introduction to animals and new situations, Kees may become timid. The Keeshond is not considered a particularly protective breed. Are Keeshonden Good Guard Dogs? Keeshonden keep watch over their homes and will bark to alert their pack to the approach of friends and strangers alike. They are not particularly aggressive, however, and won't go on the offensive with intruders. Keeshonden are lively dogs who require moderate amounts of daily activity. May develop nuisance barking if left alone too long. They're heavy shedders, especially when they 'blow' their undercoat. They require frequent brushing to prevent matting. Indoor Happy Keeshonden live indoors with their families. This breed will develop problem behaviors if left outside alone for too long. Inside the house, they will never be far from you, so it's a good thing they are excellent, loving company. Keeshonden shed heavily, so frequent vacuuming is part and parcel of owning this breed. Outdoor The Keeshond's thick double coat keeps them warm outdoors in cold weather and makes them prone to overheating when it's hot and humid. Keeshonden benefit from an enclosed yard where they can run and play with you, but it is not necessary if you take them out for frequent walks. Exercise A healthy Keeshond requires about an hour of physical activity each day to remain fit. Endurance Keeshonden have the stamina for half hour play sessions several times a day, between which they'll enjoy resting on the couch or a comfy dog bed. Running Miles: Keeshonden are not distance runners, but they will trot by your side for a mile or two. Don't run with your Keeshond if it's hot or humid, as they are susceptible to overheating. Hiking Miles: Keeshonden will enjoy two- to four-mile hikes with you when it isn't hot, and will go even further when it's cold. Food Generally, this breed requires 1 to 2 cups of good quality dry dog food each day given in two feedings. This will vary, however, based upon your Keeshond's activity level and age. Talk to your veterinarian about the optimal diet and quantity of food for your Keeshond. Alone Time Keeshonden are averse to spending time alone and will turn to barking and destructive chewing to convey their displeasure. If you must leave your Keeshond alone for an hour or so, it's ideal if they are crate trained and have a puzzle toy filled with a favorite treat to keep them occupied. To keep matting to a minimum, brush your Keeshond daily or every other day. Be sure to brush through their undercoat in the process. This breed doesn't have an intense dog smell and needs a bath and blow dry only once every month or so. The hair around their paws needs trimming when they are groomed, as well. Wash your Keeshond's ears weekly with a gentle, dog-friendly cleanser to prevent dirt buildup that can cause infections. Keeshonden should have their teeth brushed several times a week, and their nails trimmed every month or so to prevent cracking. 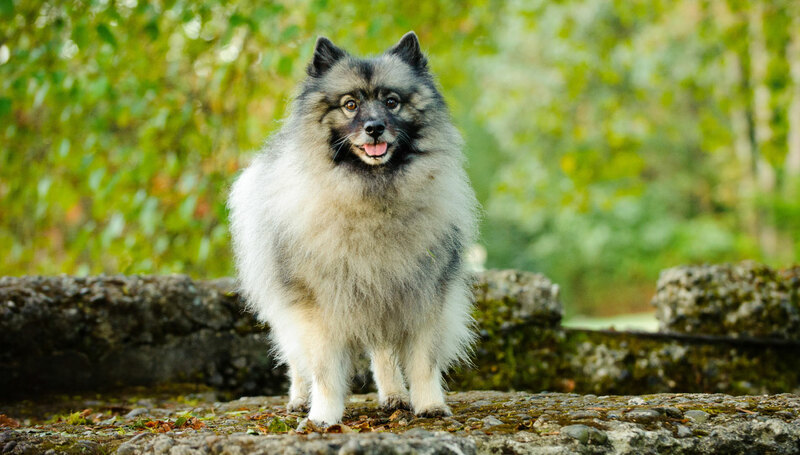 You can minimize serious health concerns in a Keeshond by purchasing from a reputable breeder who engages in responsible breeding practices, and through screening for common diseases and conditions. Keeshonden are quick on the uptake and learn basic commands quickly. Positive reinforcement, dog treats, and consistency yield the best results with this sensitive breed. Agile and athletic, Keeshonden benefit in mind and body when they participate in advanced obedience training, agility training, and most dog sports. Keeshonden are not skilled hunting dogs. No. The Keeshond's thick coat sheds abundantly and, as a result, leaves pet dander in your home. Pet dander is the cause of most pet related allergies. Can Keeshonden live in warm climates? Keeshonden can adjust to warm climates. Their undercoats will thin out in hot and humid seasons and their coats provide some cooling insulation in the heat. However, their fur is so dense they are at risk of overheating in direct sunlight and when exercising in hot weather. Be sure to watch your Keeshond closely for signs of heat exhaustion and offer them plenty of cool water on walks and in the yard when it's hot. Keeshonden can learn to swim and many enjoy jumping in the water or wading in the shallow end to cool off when it's hot. However, their thick coats can weigh them down, so Keeshonden should be watched closely when they swim, and their time in the water should be kept brief so they don't tire out.